With the release of General Motor's plans for its half ton pickup trucks, the 2014 GMC Sierra 1500 and the 2014 Chevrolet Silverado 1500, it's clear that the new models will eschew a hybrid powertrain. Why? General Motors introduced its first hybrid pickup truck back in 2004 as part of the GMC Sierra 1500 / Chevrolet Silverado 1500 option package. Today, we'd call that hybrid a "mild hybrid" as it was basically a start-stop system with extra batteries (all lead acid) to accommodate all the extra idle time encountered. In 2009, GM then introduced the Two-Mode Hybrid powertrain still in production today. 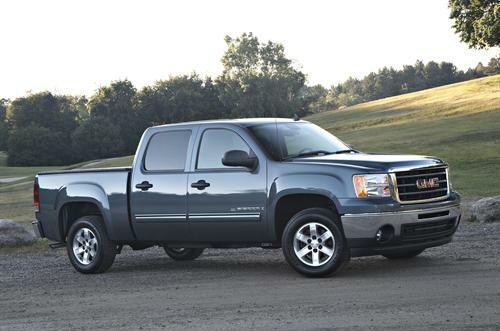 With the release of information for the 2014 model year re-design of the GM 1500 pickup truck line, we see an absence of a hybrid offering. Why is that? The hybrid GMC Sierra 1500 and Chevy Silverado 1500 trucks had a slow, accounting for less than 3% of the company's overall truck volume since their release to the public. Traditionally, pickup truck buyers looking at light-duty trucks in the 1/2 ton range (which the 1500 line is) want the truck to be able to tow a medium-sized trailer (up to 3,000 pounds) and sales are generally in favor of four wheel drive models amongst non-commercial buyers. Commercial buyers usually look at resale value as a top priority as a typical commercial buyer will purchase new and expect to re-sell in 2-3 years and show return on investment overall. Last year, however, total sales of hybrid pickup trucks (of which GM is the only maker) were less than 1% of overall sales to consumers and less than 2.5% overall. General Motors has so far been the only truck maker willing to get into the hybrid pickup game. Other prominent pickup builders, including Ford and Chrysler's Ram Truck, have eschewed hybrids in favor of highly efficient power plants. Ford has been pushing and finding great success with its EcoBoost engine line in light-duty pickup sales (F150 line) while Ram Truck has now released a near-V8-equivalent V6 coupled to an 8-speed transmission that rivals the capabilities and price tag of both Ford's most fuel efficient offering and GM's hybrid trucks. The obvious lack of interest from pickup truck buyers in hybrid powertrains (and their higher price point) has made it clear to the nation's largest truck makers that consumers are not interested in a hybrid option, though they do prefer higher fuel efficiency. Frankly, in pickup trucks, it appears that a hybrid-electric option is not cost-effective for meeting efficiency goals. The new generation EcoTec engines, called EcoTec3, will appear in the General Motors half ton pickup line as a 6-cylinder and two 8-cylinder options in 4.3L, 5.3L and 6.2L respectively. Although the EPA estimates and efficiency specifications fo rthsoe engines has not been released, unofficial reports are saying the V6 will have an MPG nearly equal to the current 2012 hybrid model while the V8s will beat their current counterparts by double-digit percentages. A new, 6-speed and possible 8-speed transmission will only further those MPG boosts. Like Ford, Ram Truck, and Toyota, GM seems to have realized that working with gasoline engine technologies is the way to go for higher fuel efficiency in light-duty pickups. Of course, it's always possible that GM plans to release information on the 2014 Silverado Hybrid and 2014 Sierra Hybrid later on, perhaps as a new-generation of their current parallel system. Given market trends and lack of sales volume increases for the current hybrids, though, it is unlikely. The cost benefit ratio for hybrid light-duty trucks and SUVs is almost non-existent. The natural gas trucks will likely do well simply because they're primarily marketed towards commercial buyers and NG vehicles typically have a higher resale value.